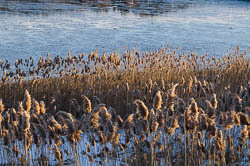 Maine Fiberarts is a statewide nonprofit membership organization formed in 2000. We welcome members who love and support fiber art and farms and the producers, makers and consumers who keep this wonderful and useful industry alive and prospering in Maine. Our programs are designed to foster this special work in basketry, beadwork, clothing design, crochet, embroidery, felting, knitting, lacework, needlework, paper, quilting, rugs, sewing, spinning, surface design, and weaving. Our goals are to create greater opportunities for artists to exhibit work, to apprentice, to mentor, to teach crafts to children, to find school residencies, to sell fleeces and fiber products, to find guilds and study groups, to learn about events, and to become better connected. Important articles are at right, Fiber Bulletin is below that, with contact information in the footer. 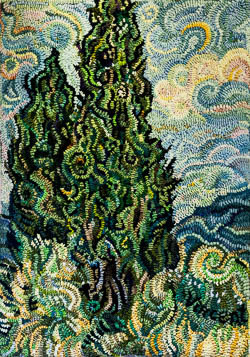 Do You Teach Fiber Art? 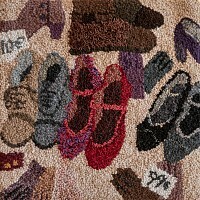 This listing is for art, craft, farm and/or fiber-related items, equipment, supplies, tools, etc. Ads will run for three months after which they will disappear. 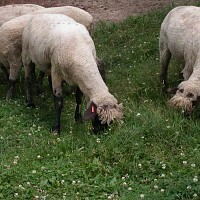 They are free for Members of Maine Fiberarts at the Professional Level ($60.00/year). Members may enter up to a 25-word description and contact information. For more information, for listing items you wish to give away for free, or to have Maine Fiberarts enter your ad for you, please contact us. To enter your own ad, look for the heading in this list called "Submit Your Own" and fill out the form. BOOK ARTS BAZAAR, 10-3, USM Portland Campus, Wishcamper Center for the Book, free and open to the public. A festival with Book Artists, papermakers, bookbinders, printmakers, educators, writers, and all things related to the book. Plenty of parking. Arlene Morris (artist books) and Christine Macchi (photography) will have tables. ABBE MUSEUM INDIAN MARKET, Bar Harbor, in the town green opposite the Abbe Museum. Indian artwork and crafts from participants within Maine and beyond. MAINE FIBERARTS hosts an exhibit of “Hooked Rugs” and our “By Hand Collection,” smaller works by members on view throughout April 2019. 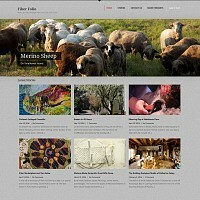 We are preparing to launch our new Art Shop, selling works that are on view in the gallery and collected during the winter at our newly-redesigned website www.mainefiberfolio.com. Coming soon! SPINDLEWORKS FIBER CIRCLE. 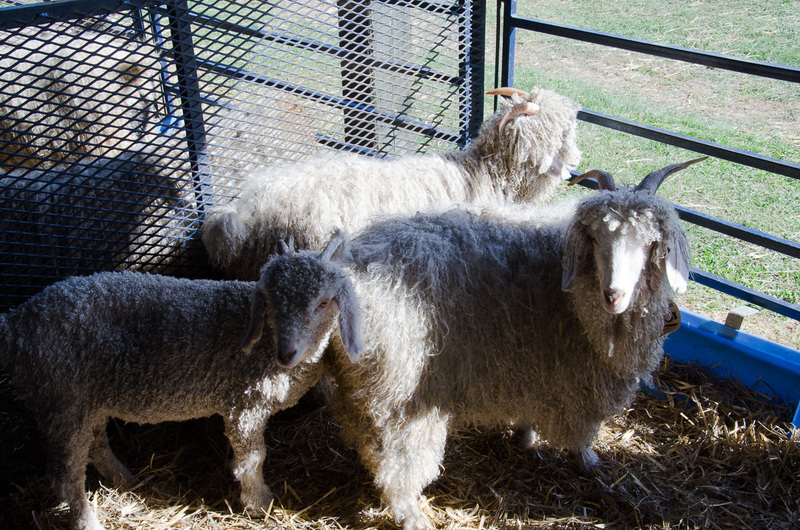 Spindleworks artists invite community members to join them while they work on fiber projects. Thursdays, 10 a.m. to noon. 7 Lincoln Street, Brunswick, ME 04011. All welcome! FMI: www.spindleworks.org, Julianne Carle, 207-725-8820. FREEPORT PUBLIC LIBRARY hosts a group of rug hookers meet every Tuesday, 1-4 p.m.
PORTLAND PUBLIC LIBRARY, Riverton Branch, 1600 Forest Avenue, Portland hosts a free Adult Knitting Groups on Thursdays starting at 6:30 p.m. Bring your knitting project and chat! MEMBERS, your regular Meet-Up could be posted here. Husband and wife artists STEVE and BARBARA BURNS were profiled in the Fall/Winter 2018-2019 issue of NORTHERN JOURNEYS, she, for her tapestry weaving and he, for his sculpture. 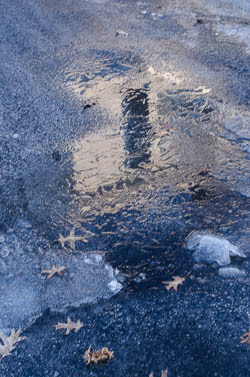 The issue includes many photos of artwork by both artists. Member CYNTHIA MCGUIRL sends the following: “Sandy Weisman, Abbie Read, Paula Blanchard, and I have formed a group to promote, encourage and educate around Book Arts. We are offering a three-day Workshop https://mailchi.mp/be90240c4145/summer-artist-book-intensive-2143789?e=1bf1ec0c14 this summer, sponsoring a show Book Arts: Maine Artists at the Camden Library in September, and have formed a Facebook Group Midcoast Maine Book Arts to facilitate discussion and opportunities. Please consider being part of the discussion by joining the group here: https://www.facebook.com/groups/325185851340562/about/. We like your letters, and your news. Keep them coming. “Study of 400,000 knitters shows how hobby evolves into business,” is an article by Andrew Van Dam appearing in the “Business” section of the PORTLAND PRESS HERALD [November 15, 2018]. The article highlights how an MIT Ph.D. candidate Hyejun Kim studied Ravelry to “shed light on the hard-to-measure early stages of entrepreneurship, and the social and economic forces that cause some to flip from ‘fun’ to ‘profit.” The article states that there are “more than 8 million people who have signed up for Ravelry since 2007” of which “96 percent are women.” Ravelry is a social media website dedicated to yarn, patterns, tools, books and designers involved with knitting and fiber techniques. MAINE CRAFTS ASSOCIATION has announced its Master Craft Artists for 2018: Patricia Daunis-Dunning, David Wolfe, and Steve Cayard. Michelle Henning is the 2018 Master Craft Artist Award pin artist, presenting artist-made pins to awardees. WATERFALL ARTS in Belfast seeks a part-time Marketing Manager to be responsible for implementing a comprehensive communications plan and coordinating marketing/promotion efforts across multiple platforms. ANNE COX is featured in the September/October 2018 issue of RUG HOOKING magazine in an article entitled, “Where the cultivated meets the wild.” Eight large photos of her rug are featured. 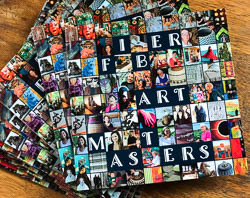 ”FIBER ART MASTERS: A Visual Tour to Maine Artists’ Studios and Work,” is a small book published by Maine Fiberarts profiling the work of twenty Maine master fiber artists ($23 plus tax and shipping through Maine Fiberarts). Meanwhile, you can take a look at the preview here. Printing is disabled, but you may download it to view it later. It is about 7 MB. You will need Adobe Reader (or Acrobat), and if you right click on this link and download it to your computer, you will be able to view it full screen if you choose. When you are done, you can get things back to normal by pressing the ESCape key. Maine Fiberarts is creating LEARNING FIBER ART: A GUIDE TO MAINE TEACHING RESOURCES in Maine and wants all artists, craftspeople, shops, learning centers, retreats, libraries and special events—offering fiber learning on a regular and ongoing basis—to get yourself listed FREE. See "Do You Teach Fiber Art?" on our Home Page or follow this link to sign up. MAINE FIBER RESOURCE GUIDE has become Maine Fiberarts Tour. This online version takes the place of our printed Tour Maps, and is THE place we direct visitors to. Listings are FREE so please fill out the online form, or call Maine Fiberarts and we will assist you: 207-721-0678. FIBER FOLIO folio.mainefiberarts.org is our photo-illustrated tour to fiber, art, craft and farms across Maine and beyond. Always new profiles and changing content, profusely-illustrated with colorful photography. A living tour. Check it out! If you have a Bulletin item to contribute to this Fiber Bulletin here, you can enter it yourself using this form. Maine Fiberarts has a CLASSIFIED ADS section. Ads are FREE for Members ($60/year or higher) and run for three months. Enter your fiber-related item or help-wanted request in the form at the bottom of every page. It is the same form you would use to add an event or bulletin listing. 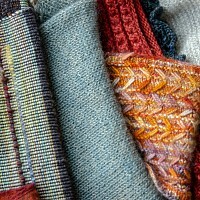 Be sure to take the FIBER ART MINI TOUR: Midcoast Maine. Read about it here. 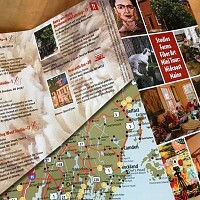 Brochures are available at Center for Maine Craft in West Gardiner; Markings Gallery in Bath; Maine Fiberarts in Topsham; Halcyon Yarn in Bath; Maine State Information Centers in Yarmouth, Kittery, Hampden North and South, Calais, Fryeburg, Houlton; Newcastle Inn in Newcastle; Henry and Marty Restaurant in Brunswick, Curtis Memorial Library in Brunswick, Wild Oats in Brunswick. If you teach fiber art of any kind, be sure to sign up for a FREE listing in our new LEARNING FIBER ART: A Guide to Maine Teaching Resources. Fill in the form below to simplify sending us your news, event, announcement or ad for our Statewide Fiber Bulletin. Please check our bulletin for other items that have been published so you will have an idea of the length and the format. Keep it brief, 25 words. Make sure emails and websites are correct and functioning before you put them in. We will delete items once they have happened, we do not keep an archive of events. Ads will run for 3 months and are free for members. Our Fiber Bulletin is not the same thing as our Fiber Resource Guide/Tour Map. If what you are announcing is a consistent or recurring event, an organization, a service or a studio that has an address that you would like to add to our digital tour, there is a link to enter your information on our map, here. Thank you to BANGOR SAVINGS BANK for sponsoring our exhibition for Elizabeth Busch! Your support is very much appreciated! MAINE ARTS COMMISSION for partial funding of a project grant to redesign, expand and promote our Fiber Folio photo blog, www.mainefiberfolio.com. We are looking for guest writers and unique ideas to feature on our online Folio. Be in touch! Maine Arts Commission is an independent state agency supported by the National Endowment for the Arts. THE EDGARD AND GERALDINE FEDER FOUNDATION for monies to reprint our FIBER ART MASTERS book since our first edition is just about out of print. Thank you! To the BELVEDERE TRADITIONAL HANDCRAFTS FUND of the MAINE COMMUNITY FOUNDATION for major funding to create our online and printed new book: LEARNING FIBER ART: A GUIDE TO MAINE TEACHING RESOURCES. Thank you, Belvedere. You are dear to us!! 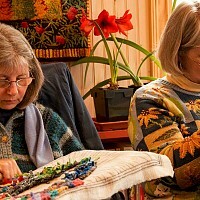 To the BELVEDERE FUND FOR EXCELLENCE IN HANDCRAFTS, a program of the Maine Community Foundation for a grant that will update Maine Fiberarts’ technology systems and our ability to present works of art and craft. To our AMAZING BENEFACTOR, who wishes to remain anonymous, and who will support Maine Fiberarts with a check for $12,500 during 2018 if we can match it. Thank you to all who gave towards this match last year. We raised $25,000 during 2017 with this incentive. Wonderful! MAINE HUMANITIES COUNCIL for an award of a Major Grant in support of our "Threads of History" show this Spring-Summer 2017. 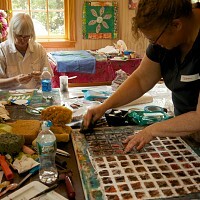 The grant supports programming at Maine Fiberarts, three scholars, one tour, and two lectures. Candace Kanes will offer a guided tour along Maine Street, Brunswick pointing out the former fiber businesses of yore: haberdasheries, dressmakers, milliners, and corsetiere shops. Historian Scott Hansen will provide a tour through Cabot Mill and a talk about Brunswick mill history. And Jacqueline Field is offering a talk on Maine's silk industry. See "Current Exhibition" for dates and locations. To TWO DONORS who wish to remain anonymous, one for general support of Maine Fiberarts during 2018 and another who is supporting our new Learning Fiber Art: A Guide to Maine Teaching Resources. Thank you! MAINE OFFICE OF TOURISM and MAINE ARTS COMMISSION for support of our Fiber Arts Mini Tour: Midcoast Maine which is now in use during Summer of 2017 and into 2018 for self-guided tours. Thank you to the following special donors who continue to support our exhibitions and programming: Verrill Dana, Ann Kaplan, Maine Humanities Council, Maine Arts Commission, Katharine Watson, Judith Connorton, Carolyn Murray, Bangor Savings Bank, Mary Lou Steptoe, Arlene Morris, Dr. Steven Stern, Mr. and Mrs. John Schaperkotter, William and Judith Winship, David and Margo Knight, Katharine Watson, Peggy Whitney Hobbs, Sue Perless, and Carolyn Wollen. Many people working together to bring beautiful shows of fiber work to our gallery! 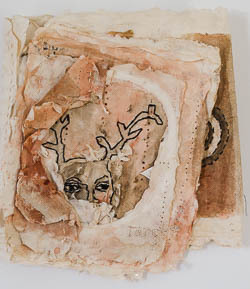 Book artist ABBIE READ of Appleton teaches “Printmaking for Collage,” April 13-14 in Belfast; “Assemblage,” at the Farnsworth Art Museum in May; “Making your own Sketchbook,” at the Steel House in Rockland in June; and “Book Arts Intensive,” Split Rock Cove, August. 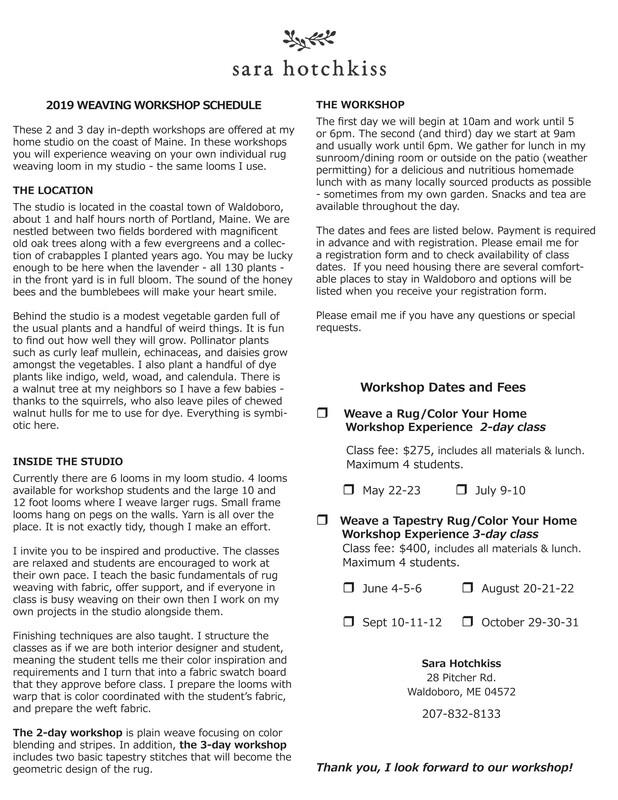 HAYSTACK MOUNTAIN SCHOOL OF CRAFTS offers workshops, residencies and a Summer Conference in their new catalog for Summer 2019 (June through August). Textile classes include; “Hand-Weaving 101,” with Christy Matson; “Social Paper: Using Text, Image, Paper, and Print for Social Practice,” Mary Tasillo and Michelle Wilson; “Obtainium/Embellish’um,” Jim Drain; “Home is Everywhere,” Doug Johnson; “Embodied Line,” Courtney Puckett; “Pulp Fictions: Developing Narratives through Papermaking,” Krista Franklin; “Around the World with Natural Color,” Kathy Hattori; “Sculptural Paper Craft: Form and Freedom,” Michael Velliquette; and “Discovering a Mindful Stitching Practice,” Christine Mauersberger. Summer Conference, July 7-11 entitled, “Craft and History: Writing a History, Preserving a Field.” Residency and scholarship applications due March 1; regular applications due April 1. FMI: www.haystack-mtn.org. FLYING WITH SCISSORS STUDIO announces a week-long intensive in Tuscany, "Stitched and Pieced," an exploration of Japanese-inspired patchwork piecing and stitching techniques—Boro, Katazome, Sashiko, Shibori, Indigo and Ikat held in San Gemini, Tuscany. April 27-)May 4 (almost full. Instructors: Kimberly Becker and Berri Kramer. Details: https://www.flyingwithscissorsstudio.com/details. Registration: https://www.flyingwithscissorsstudio.com/register ($500 non-refundable deposit required with registration form, can be paid online). 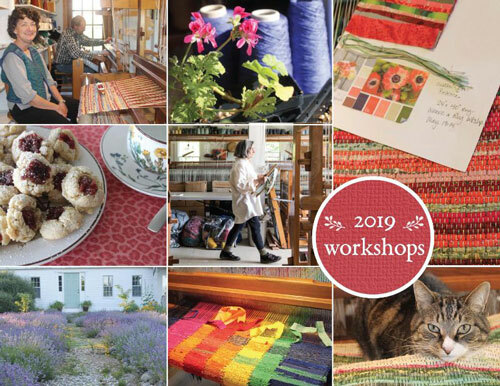 Two new retreats added: “Japanese Piecing and Slow Stitching” in Live Well Farm, a cozy farmhouse setting in Harpswell, Maine, February 14-17, 2020 and “Explore Vintage Japanese Textiles and Techniques including Sashiko Stitching and it’s rich history,” Versailles, France, November 11-18, 2019.